The key moment in Tim Cook’s first keynote as Apple CEO didn’t concern the new iPhone at all. Instead, it came near the end of his roundup of Apple’s business across its product lines. If you’re a professional or amateur Apple Kremlinologist looking for clues as to how Cook will run the company, or even its big media events, this is the moment worth giving your attention. Cook’s opening slideshow was mostly a dry set of charts and numbers showing Apple’s overwhelming growth in every metric across its entire business. Cook moved through them equally mechanically. 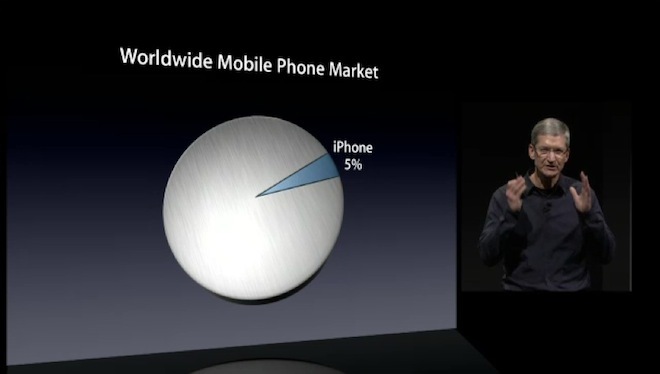 But after showing the growth of iPhone, he showed something quite different. “Despite all of this success and all of this momentum, the iPhone has 5 percent share of the worldwide market in handsets,” Cook said. His tenor had changed. Now he wasn’t justifying Apple to the room; he was challenging it. Everyone knew there were going to be differences in style and emphasis between Jobs and Cook. Jobs could sell Apple’s success, using a combination of “gee whiz, can you believe this?” faux-humility and “oh yeah, that’s right” swagger. Jobs could deliver lines like “the iPod didn’t just change how we listen to music; it changed the music industry” with the insider appreciation of both someone who’d run a creative company and one of pop music’s most famous fans. Jobs could fill a room with developers who’d spent their entire adult lives with him and the company he built at the top of their minds, and get a standing ovation just for walking into it. Cook is different. He’s the global business thinker. And he’s the taskmaster. He’s there to give you the key details, clear away the crap and refocus everyone on the big picture. If Jobs took visible pride in finally bringing The Beatles’ music to the iTunes store, Cook took equal public pride in bringing Apple’s retail stores to China and continuing to expand there. And beyond there, to everywhere. That’s what excites him. That’s what challenges him. That’s where he wants to take Apple. Maybe that’s boring to folks who are ready to write down the company’s prospects if it doesn’t put on the show they want to see. But it’s not boring at all, especially if you understand just how far the company’s come, and how much work there still is to do. For Tim Cook, whether it’s the brand-new iPhone or the entire company, it’s not about showing off a flashy new enclosure. It’s about engineering the pieces inside that make it all work. Making it better.